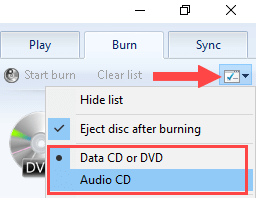 This tutorial will show you step by step how to burn an MP3 CD in Windows 7, 8 and 10 in two different ways without using third-party CD burning software. 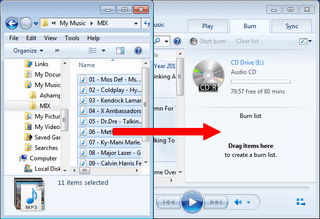 You can create and burn a MP3 CD in Windows using the Windows built-in CD burning feature or Windows Media Player. With Windows Media Player you can also burn your MP3 music to a CD that will play on any CD player and car stereo. Note: If you want to burn your MP3 music to a CD that can play on any CD player and car stereo, then use the second method (with Windows Media Player) on this page. If you want to have an organized MP3 CD, then it's a good idea to create folders on your computer and copy the MP3 files into these folders before you start the burning process. I recommend using a CD-R instead of a CD-RW (rewritable), because not all CD players can play rewritable CDs properly. Place all MP3 files or folders in one folder and make sure that the total file size of that folder does not exceed the capacity of your CD (usually 650 MB or 700 MB). To view the file size of a folder, right-click on the folder and choose Properties. 1. Insert a blank (empty) CD into the CD burner drive of your PC. 2. 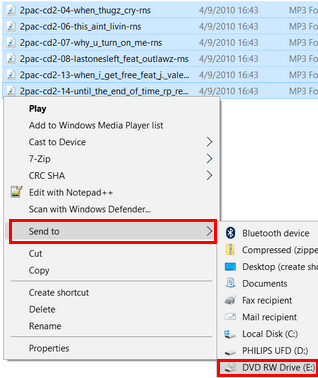 Go to the location on your computer where the MP3 files or folders are stored you want to burn to a CD. 3. Select all the MP3 files or folders. 4. Right-click on the selected files or folders, go to Send to and choose your CD burner drive (e.g., DVD RW Drive (E:) or CD RW Drive (E:) ). 5. At Disc title you enter a name for your disc. 6. Select With a CD/DVD player. Your files/folders will now be copied to the CD burner drive of your PC and when it's done copying, it will open the CD burner drive in a new window. 8. When you're done copying files/folders to your CD burner drive, you click on Drive Tools. 9. Click on Finish burning. Windows will now burn your MP3 CD. Tip: I recommend using a CD-R instead of a CD-RW (rewritable), because not all CD players can play rewritable CDs properly. 3. Click on the Burn tab at the top right (between the Play and Sync tab). Data CD or DVD: if you want to burn MP3 files to a data CD. This CD will only play on computers and on CD players and car stereos that support the MP3 audio format. Audio CD: if you want to burn MP3 files to an Audio CD. This CD will play on any CD player and car stereo. 6. Go to the location on your PC where the songs are stored you want to burn to a CD. 7. Make sure that the Windows Explorer window and Windows Media Player are both visible and located next to each other. 8. Drag the MP3 files from Windows Explorer to the burn list in Windows Media Player. Note: The total time or file size (MB) cannot exceed the capacity of your CD (usually 74 or 80 minutes or 650 MB or 700 MB). Tip: You can view the time in minutes or file size in MB you have left on your CD at "_:_ free of _ mins" (e.g., 20:03 free of 80 mins) or _ MB free of _ MB (e.g., 559 MB free of 702 MB) located just above the Burn list. 9. You can also reorder the songs on your CD by dragging and dropping the songs into the position of your choice. 10. When you're ready, you click on Start burn located above the Burn list and underneath the Play tab. Windows Media Player will now burn your MP3 CD.